Land-use planning often leads to land-use regulation, which typically encompasses zoning. Zoning regulates the types of activities that can be accommodated on a given piece of land, as well as the amount of space devoted to those activities, and the ways that buildings may be situated and shaped. The ambiguous nature of the term “planning”, as it relates to land use, is historically tied to the practice of zoning. Zoning in the US came about in the late 19th and early 20th centuries to protect the interests of property owners. The practice was found to be constitutionally sound by the Supreme Court decision of Village of Euclid v. Ambler Realty Co. in 1926. Soon after, the Standard State Zoning Enabling Act gave authority to the states to regulate land use. Even so, the practice remains controversial today. The “taking clause” of the Fifth Amendment to the United States Constitution prohibits the government from taking private property for public use without just compensation. The case of Dolan v. City of Tigard demonstrated the criteria that determine the threshold of what is considered taking. One interpretation of the taking clause is that any restriction on the development potential of land through zoning regulation is a “taking”. A deep-rooted anti-zoning sentiment exists in America, that no one has the right to tell another what he can or cannot do with his land. Ironically, although people are often averse to being told how to develop their own land, they tend to expect the government to intervene when a proposed land use is undesirable. Conventional zoning has not typically regarded the manner in which buildings relate to one another or the public spaces around them, but rather has provided a pragmatic system for mapping jurisdictions according to permitted land use. This system, combined with the interstate highway system, widespread availability of mortgage loans, growth in the automobile industry, and the over-all post-World War II economic expansion, destroyed most of the character that gave distinctiveness to American cities. 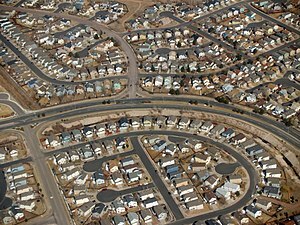 The urban sprawl that most US cities began to experience in the mid-twentieth century was, in part, created by a flat approach to land-use regulations. Zoning without planning created unnecessarily exclusive zones. Thoughtless mapping of these zones over large areas was a big part of the recipe for suburban sprawl. It was from the deficiencies of this practice that land-use planning developed, to envision the changes that development would cause and mitigate the negative effects of such change. As America grew and sprawl was rampant, the much-loved America of the older towns, cities, or streetcar suburbs essentially became illegal through zoning. Unparalleled growth and unregulated development changed the look and feel of landscapes and communities. They strained commercial corridors and affected housing prices, causing citizens to fear a decline in the social, economic and environmental attributes that defined their quality of life. Zoning regulations became politically contentious as developers, legislators, and citizens struggled over altering zoning maps in a way that was acceptable to all parties. Land use planning practices evolved as an attempt to overcome these challenges. It engages citizens and policy-makers to plan for development with more intention, foresight, and community focus than had been previously used. In most countries, the local municipal council/local government, the body responsible of the Environment and oftentimes the national government assume all the functions of land use planning; among them the corresponding function to territorial ordering (OT). For this reason, the highlighted bodies have among other responsibilities the promotion of the conservation and sustainable use of natural resources, establishing policies, criteria, tools and procedures of the most appropriate efficient and sustainable territorial order in coordination with any other relevant corresponding entities such as construction companies and the public. "Developing cities and towns": Land use planning is an important component of city planning. The nature of cities required to the most beneficial use in terms of maximization of economic factors and promoting convenience, while maintaining the quality of the environment and promoting conservation of the land. The only way to achieve this is the utilization of the elements of land use planning. "The concept of Zoning": Zoning is the process by which areas of land are split into zones by appropriate establishments within which several users are assigned to each zone. Therefore, this makes zoning very important modus operandi in land-use planning where it is used to design urban areas in many countries (Lewis-Roger, 1987). The topic of zoning is considered within the context of land use planning and design as a systemic perception. Zoning is used as a fundamental component of territorial planning, which is incorporated in the stages of the logical model of regional development. In the process of zoning, the actor divides land into units of different sizes, shapes and locations, according to the characteristics of the terrain and the corporality of a culture. The actor who generates a multiplicity of spaces using zoning, based on global spatial unit and the preferences of user who uses these spaces in multiple use form, decomposes his vision of it into four different dimensions namely; deontic, cognitive, expressive and aesthetics functions. Each of these dimensions represents land in different forms, intensities, positions and areas, which may not coincide with each other. The deontic space is that of the transforming actions of the world, of the duty to be and to do. The cognitive space is apprehended by the faculties of knowledge from the senses to the reason, such as the ecological and technological spaces. The aesthetic space refers to the scopes of feel and beauty. The expressive or indexical space corresponds to the internal and cultural expression of the identity of the person who organizes the space. Often, a fifth space is included, that is, the administrative space, which concerns the positioning of the legal, authoritative and legislative base being planned. Zoning should not be considered as the end in itself, but only as a means of approximation in relation to geographical reality. Instead of imposing pre-established categories, it is about looking for landscape discontinuities. The category system (taxonomy) must allow a deepening (level) of the landscapes according to their scale. For each order of phenomena there are thresholds of manifestation and “extinction” that by themselves can justify the systematic differentiation of landscapes into hierarchical units. The study and zoning of the coverage and land use requires first defining the concepts of land, coverage and use in order to avoid the problems of interpretation associated with the management of these concepts. The concept of land is defined as an entity formed by the mutual interaction of living and non-living nature in a recognizable portion of the Earth's surface. It is a more geographical than edaphological definition. The earth is conceived as the result of the integration of biophysical and socioeconomic elements whose interrelation generates certain particular spatial units or landscapes, therefore, land and landscape are considered in this guide as synonyms. Land cover, on the other hand, is defined as the different features that cover the land, such as water, forest, other types of vegetation, bare rocks or sand, man-made structures, etc. In general, these are the traits that can be directly observed in aerial photographs and frequently in satellite images. The concept of use, applies to the employment that man gives to different types of coverage, cyclically or permanently to meet his material or spiritual needs. Basically, this is where the need for zoning arises. Community relation: For any land planning activity to be commenced the involved actors must involve the community or the member of the public in order to put into consideration their opinions on the proposed land planning initiatives. After all, the land is being planned so that the public can enjoy the benefits that comes from land use planning. Government and legal support: the government can support land use planning initiatives in a myriad of ways. The first is by financing or subsidizing a section of land use planning activities. The second way is by reducing bureaucracy and administration bottlenecks that comes with obtaining permits and licenses. Land use planning is an important growth framework: certainly, prosperous urban areas have a vision that they must follow through a framework to achieve a development in a well-ordered way. Hence, land use planning provides this framework. A well planned urban area is a well-prepared urban area: Anticipating the future allows for better preparedness. Indeed, the presence of natural phenomenon that represents a threat to human life activities implies a limitation in the use of land. It is necessary then, to plan the use of the land taking into account its limitation in order to allow the containment of natural phenomenon and its manifestations either by restricting the presence of human life and/or activities, adapting infrastructure conditions in a manner that reduces its vulnerability to natural phenomenon or implementing plans conducive to risk mitigation. The absence of territorial planning plans, the lack of definition of areas exposed to threats and the lack of studies on natural phenomena that might bring threats, ensure an increase in the number and magnitude of disasters of natural origin. The process of land use planning developed putting into consideration this aspects, allows the identification, location and evaluation of areas exposed to natural phenomena, hence allowing the implementation of measures that guarantee risk mitigation. Good land use planning positively impacts the development of urban economy. Promote the national territorial order and economic ecological zoning as a support for the conservation, use and sustainable use of natural resources and biological diversity, as well as the orderly occupation of the territory. Incorporate the analysis of natural and anthropic risk in territorial planning processes, as well as adaptation measures to climate change. Promote mechanisms to prevent the settlement of populations and the development of socio-economic activities in areas with high potential for risks in the face of natural and anthropic hazards. Promote territorial planning as a basis for concerted development plans and border development, in the management of watersheds and coastal marine areas. Guides the actions of regional and local governments for the efficient fulfillment of their functions in this area of land use planning. The cost of land use planning is usually high. Land use planning is often plagued by bureaucracy and administrative bottlenecks. Land use planning takes a lot of time. In view of sustainable development, land use planning is seen as a political and technical-administrative decision-making process agreed with social, economic, political and technical factors, for orderly occupation and sustainable use of the land under development. On the other hand, it seeks regulation and promotion of the location and sustainable development of human settlements, economic and social activities, and spatial physical development, based on the identification of potentialities and limitations that consider environmental, economic, sociocultural, institutional and geopolitical criteria. By and large, these parameters are put in place in order to make sure that the environment is protected during land use or land development. Indeed, based on the recommendations of the United Nations in its Habitat conference, land is assigned a high importance for the development of human life as it is the fundamental support for its permanence and development, this being the most important objective of the policy of human settlements. That is, the land resource is recognized as an essential element, which supports the social, political and economic formation of society. As mentioned earlier, the use of land refers to the occupation of a certain area according to its agrological capacity and therefore its development potential, it is classified according to its location as urban or rural, it represents a fundamental element for the development of the city and its inhabitants since it is from these that its urban structure is formed and therefore its functionality is defined. For this reason, there is a need to ensure sustainability in order to ensure the we continue to enjoy the benefits that come from urban planning and to ensure that future generations will continue enjoying these benefits. To guarantee this, land use planning come into the fold. In a broader sense, this is a tool through which State defines the type of use land will have within a settlement, e.g. a city, while also determining the guidelines for its use in order to ensure effectiveness and sustainability. Land use, in this case, is assigned on the basis on its physical and functional characteristics that they have in the urban structure, and with the aim of occupying the space in an orderly manner and according to their physical capacity (occupation of areas suitable for urban development and environmental sustainability), which finally it translates into a harmonious growth of the city. This tool is structured through a planning system at the national and local level, which establishes the general guidelines that should be taken into account for the development of urban development. Here, the authorities involved might formulate a number of restrictions to guarantee sustainability, for example, banning land development in riparian zones or in national parks. Basically, the goal here is to protect the environment. Traditional or comprehensive planning: Common in the US after World War II, characterized by politically neutral experts with a rational view of the new urban development. Focused on producing clear statements about the form and content of new development. Systems planning: 1950s–1970s, resulting from the failure of comprehensive planning to deal with the unforeseen growth of post World War II America. More analytical view of the planning area as a set of complex processes, less interested in a physical plan. Democratic planning: 1960s. Result of societal loosening of class and race barriers. Gave more citizens a voice in planning for future of community. Advocacy and equity planning: 1960s & 70s. Strands of democratic planning that sought specifically to address social issues of inequality and injustice in community planning. Strategic planning: 1960s-present. Recognizes small-scale objectives and pragmatic real-world constraints. Environmental planning: 1960s-present. Developed as many of the ecological and social implications of global development were first widely understood. Tenure responsive planning: 2015-onwards. It recognizes that land use planning should be collaborative but with the purpose of tenure security improvement. This is a hybrid approach whereby traditional, advocacy, democratic and bottom-up efforts are merged in such a way that they focus towards tenure security outcomes. Today, successful planning involves a balanced mix of analysis of the existing conditions and constraints; extensive public engagement; practical planning and design; and financially and politically feasible strategies for implementation. Current processes include a combination of strategic and environmental planning. It is becoming more widely understood that any sector of land has a certain capacity for supporting human, animal, and vegetative life in harmony, and that upsetting this balance has dire consequences on the environment. Planners and citizens often take on an advocacy role during the planning process in an attempt to influence public policy. Due to a host of political and economic factors, governments are slow to adopt land use policies that are congruent with scientific data supporting more environmentally sensitive regulations. Aerial view of Rosslyn-Ballston corridor in Arlington, Virginia. 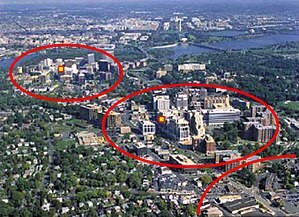 High density, mixed use development is concentrated within ¼–½ mile from the Rosslyn, Court House and Clarendon Washington Metro stations (shown in red), with limited density outside that area. This photograph is taken from the United States Environmental Protection Agency  website describing Arlington's award for overall excellence in smart growth in 2002 — the first ever granted by the agency. Smart growth supports the integration of mixed land uses into communities as a critical component of achieving better places to live. Putting uses in close proximity to one another has benefits for transportation alternatives to driving, security, community cohesiveness, local economies, and general quality of life issues. Smart growth strives to provide a means for communities to alter the planning context which currently renders mixed land uses illegal in most of the country. Professional planners work in the public sector for governmental and non-profit agencies, and in the private sector for businesses related to land, community, and economic development. Through research, design, and analysis of data, a planner's work is to create a plan for some aspect of a community. This process typically involves gathering public input to develop the vision and goals for the community. A charrette is a facilitated planning workshop often used by professional planners to gather information from their clients and the public about the project at hand. Charettes involve a diverse set of stakeholders in the planning process, to ensure that the final plan comprehensively addresses the study area. Geographic Information Systems, or GIS, is a very useful and important tool in land-use planning. It uses aerial photography to show land parcels, topography, street names, and other pertinent information. GIS systems contain layers of graphic information and their relational databases that may be projected into maps that allow the user to view a composite of a specific area, adding an array of graphically oriented decision making tools to the planning process. A transect, as used in planning, is a hierarchical scale of environmental zones that define a land area by its character, ranging from rural, preserved land to urban centers. As a planning methodology, the transect is used as a tool for managing growth and sustainability by planning land use around the physical character of the land. This allows a community to plan for growth while preserving the natural and historical nature of their environment. Natural ecology and historical identity of the city are matched to its topography in the Urban Landscape System approach that intends to mitigate effects of climate change and improve city branding through the ontology of place. Police power is the basis for land use planning authority in the United States. This authority is usually delegated by state governments to local governments, including counties and cities. It is these local governments that most frequently exercise police power in land use planning matters. The regulation of land use based on police power is distinct from the taking of private property by the government through the power of eminent domain. If the regulation of land use is done under the authority of the police power, the private property owner isn't typically entitled to compensation as they would be if property was taken under the power of eminent domain. The court decision in the case Commonwealth v. Alger was related to land use planning and dealt with the construction of a wharf on privately owned tidelands around Boston Harbor. Milan city is located in northern Italy. It is the second most populous city in the country after Rome with a population of over 4 million (The CDB and its metropolitan Boroughs). Every area in Milan is a segment that starts from the center and reaches the city limits, so that central areas and peripheral areas are part of the same area. In Milan, zones are not identified by names but numbers. The city hall area 1 of Milan includes the entire historical center, starting from the geographical center of Milan in Piazza Duomo up to the Cerchia dei Bastioni. The town hall area 2 goes from Piazza della Repubblica to Crescenzago, Turro, Greco and Precotto. The town hall 3 goes from Porta Venezia to Lambrate, passing through Città Studi. The town hall area 4 goes from Porta Vittoria to the Forlanini park, also including Porta Romana, Corvetto and Santa Giulia. The town hall 5 goes from Porta Ticinese to the Agricultural Park, passing through Chiesa Rossa and Gratosoglio. The town hall 6 goes from the Darsena, up to Barona, Lorenteggio and Giambellino. The city hall area 7 goes from Porta Magenta to Baggio and Figino passing through San Siro. The town hall zone 8 goes from Porta Volta to Quarto Oggiaro, passing through QT8 and Gallaratese. And lastly, the town hall area 9 goes from Porta Nuova to Niguarda and Bovisa. The idea here, is to allow members of the nine zones to get easy access to the CBD. Effective measures have been put in place to limit the impact of human activates on the many water bodies in this city such as restricting land development in riparian areas. In fact, the drive for the establishment of this city on the land where its stand was easily accessibility to water. Due to the increasing discussions in the issues of climate change and global warming, the future of land use planning will be dominated by environmental sustainability themes more than economic convenience. ^ Martha Derthick. Dilemmas of Scale in America's Federal Democracy. p. 257. ^ a b c Savini, Federico; Aalbers, Manuel B (2016-07-26). "The de-contextualisation of land use planning through financialisation: Urban redevelopment in Milan". European Urban and Regional Studies. 23 (4): 878–894. doi:10.1177/0969776415585887. ISSN 0969-7764. ^ a b c d e f Long, Hualou; Qu, Yi (May 2018). "Land use transitions and land management: A mutual feedback perspective". Land Use Policy. 74: 111–120. doi:10.1016/j.landusepol.2017.03.021. ISSN 0264-8377. ^ Lewis, Roger K. (1987) “The Powers and Pitfalls of Zoning,” and “From Zoning to Master Planning and Back.” In shaping the City. Washington, DC: AIA Press 1987, pp 274 281. ISBN 0913962880. ^ "Arlington County, Virginia - National Award for Smart Growth Achievement - 2002 Winners Presentation | Smart Growth | US EPA". Epa.gov. 2006-06-28. Retrieved 2012-12-30. ^ Stürck, J., Levers, C., van der Zanden, E. H., Schulp, C. J. E., Verkerk, P. J., Kuemmerle, T., ... & Schrammeijer, E. (2018). Simulating and delineating future land change trajectories across Europe. Regional Environmental Change, 18(3), 733-749. Barnet, J. (2004). Codifying New Urbanism: How to Reform Municipal Land Development Regulations, Chicago, IL. Southwestern NC Planning and Economic Development Commission, Community Foundation of WNC, & the Lawrence Group Architects of NC, Inc. (2009). Region A Toolbox, A Pilot of the Mountain Landscapes Initiative, Sylva, NC. Walters, David. (2007). Designing Community, Charrettes, Master plans and Form-based Codes, Oxford, UK. Young, Anthony. (1993). Guidelines for Land Use Planning, Food and Agriculture Organization of the United Nations, Rome, Italy. Chigbu et al. (2017). Combining land-use planning and tenure security: a tenure responsive land-use planning approach for developing countries. Journal of Environmental Planning and Management, 60(9):1622-1639.